3Gstore.com Blog: EVDO ExpressCard, USB, PC Card: Which is faster? We get asked this question every day: which form factor is faster for EVDO devices? Our answer is that form factor has nothing to do with realized EVDO speeds. The devices are made in different form factors simply to accommodate the needs of different customers. Not everyone has a card slot, nor does everyone want to use USB if they have a card slot. Seems like a simple enough answer to believe, right? But nooo... the folks who believe themselves to be technically aware always want to argue that ExpressCards have to be faster than PCMCIA which has to be faster than USB. Yes, they are right. In general, thats the way most rank the form factors as it pertains to speed through a slot/port. But let me give you an example that shuts up most geeks in an argument over form factor selection, as it pertains to EVDO. Now, let's hook up to the inlet side of these 3 hoses, a 1/4" diameter supply hose. That's 0.25" diameter for you geeks. Which of the 3 hoses is now going to move more water in one minute? the 6", the 4" or the 2"? The answer is: they will all move the same amount of water. Why? because the available supply line moves much less water than the capacity of the hose being tested. ExpressCard slots are capable of 2.5 GIGAbytes per second. PCMCIA comes in many flavors, but the highest spec I could find says it will move 33 MEGAbytes per second. USB 2.0 is 480 Megabits per second. (Google tells me that translates to 60 MEGAbytes per second, so it can actually be faster than PCMCIA.) Heck, USB 1.0 is already 11 Megabits per second and that has to represent the slowest of all the form factors an EVDO device will work with. So if all of these different form factors were supplied with exactly the same 3.1 Mbit/sec bandwidth of the absolute most pristine EVDO Rev-A connectivity, how much will each form factor be able to move through it? You guessed it. the same 3.1 Mbit/sec! The EVDO devices are made in different form factors, simply to accommodate the needs of different customers. Not every customer has an ExpressCard and/or PC Card slot, and not everyone wants a USB device if they can use an available card slot. When a customer asks us "Since I can use any form factor, and I want the fastest device - what should I get? ", we tell them that when tested under identical conditions, the devices are all the same speed. You need to make a decision based on other factors and not the speed of the device. 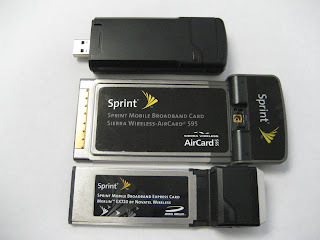 We're EVDO Experts and we have practical experience with each and every device sold by Sprint and Verizon. We have helped thousands of our customers put together the right combination of EVDO Gear to give them the wireless broadband solution they were after. We're ready to explain the differences that each form factor can provide you, and get you setup with the best possible EVDO solution. We look forward to serving you as our customer.